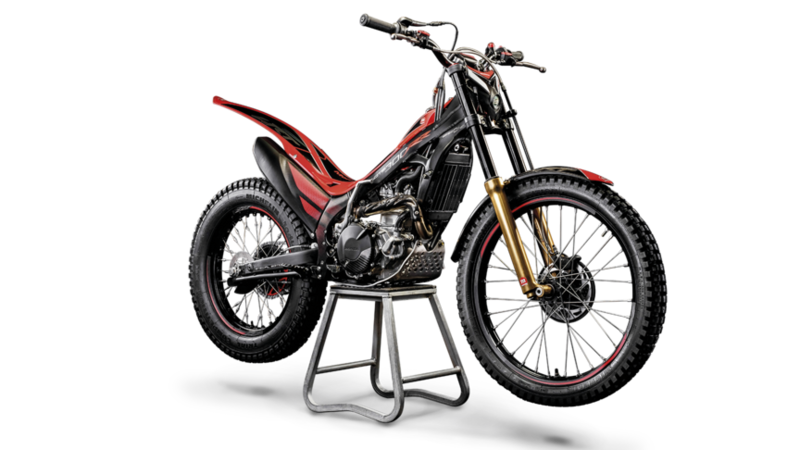 The Montesa Cota 300RR has been uniquely developed with a focus on increasing power and reducing weight, resulting in an exclusive race orientated machine that's reflective of our expert team's proven experience in Trial Championships. Compete with features that deliver precision and control. The Montesa Cota 300RR features a redesigned engine that delivers a noticeable lift in displacement to 289cc, due to an increase in the diameter of the piston (+2mm) and stroke (+3mm). The 300RR features a new fuel pump for the PGM-Fi Electronic Fuel Injection system which allows for increased fuel flow. Engine braking has also been reduced, giving the bike a lighter feel with easier control. The Montesa Cota 300RR features a modified clutch system with a new pump that delivers additional power and responsiveness to help you take complete control. Michelin XII tyres with aluminium hubs provide excellent response and grip whilst the aluminium frame and swingarm provide exceptional performance with a truly lightweight feel. Experience optimised control that you can rely on with 300RR's single, 4-stroke, 4-valve, liquid cooled engine with 288cm3 displacement and ECU with enhanced ignition mapping that optimises performance and control of the power plant. Featuring a SHOWA shock absorber, the 300RR boasts a TECH suspension fork created with aluminium tubes making it 2kg lighter than Cota 4RT, weighing a total of 72kg. Colwyn Bay Montesa are taking orders now for the 2018 Montesa Cota 300RR. This bike is now available for viewing in the showroom. Alternatively, please call and speak to Steve on 01492 535959 or you can Contact Us through our enquiry form at the bottom of this page. Engine Type Single, 4-strokes, 4 valves, SOHC, liquid cooled. Suspension Rear Pro-Link system with Showa shock, pre-load and rebound adjustment. 170 mm stroke.